As these three YouTube videos relate to ED's work, and as it has been much discussed here, I thought they might be of interest. YouTube - Homemade magnetic amplifiers made from common materials. What do you think would be the result if three capacitors were added to your duo-diode schematic? Do you think these simulations would produce buildable results? The addition of the two 1pF capacitors stimulate Eric Dollard's analog computer in LMD mode while the right-most capacitor of 100pF regulates both the frequency, resistance/impedance, and gain of power across the counter-wound pair of load coils beside it. The battery must be cut off immediately after startup or else it will drag the gain preventing it from occurring. The aerial could have been used as a reference from the beginning and throughout the simulation in place of the battery's initial contribution, but I liked the influence of using the ground at startup for its initial reference is unique apart from the aerial's referencing influence - so I kept the battery for its momentary contribution. I say 'reference', since I do not believe any energy comes from either the ground nor the air despite all appearances and our common belief system. It is a little known secret that all 'free' energy comes out of the multiplication of waves. Eric's use of capacitance interacting with inductance is a guarantee of wave manufacture. All I do is make sure the coils I simulate for wave multiplication have magnetizable cores (not air cores) often times with moderately low inductance (100 nano Henrys or less) and the capacitors are likewise between 1 to 10 pF. This insures that these two sets of components quickly reach saturation and react as Eric says they will: the energy entering/absorbed by the capacitors is not the same energy as that which comes back out. That emission is from counter-space using (I suspect) the capacitor's dielectric as a portal negotiating between space and its counterpart. I'm left to imagine that a similar situation is occurring among a pair of low level inductors negotiating a magnetic interchange, an interaction, between space and counter-space. Since energy is composed of more than merely information (its waveform), the energy needed to incarnate (flesh out) waves comes out of the materials of a circuit's construction. That is why too much gain melts, or explodes, a circuit's components resulting in its self-destruction. And this is why energy is theoretically limitless within the boundaries of a circuit's tolerance to support it. Eric Dollard's LMD is a self-saturating module. That's why it comes as a pair of inductors coupled with a pair of capacitors: each saturates its duplicate component. This saturation makes overunity possible since what goes into a component does not equal what comes out provided all amperage references (what we normally call 'sources') have access to unlimited variability, such as: the Earth or an aerial. Thus, all I had to do was add a pair of low level capacitors to Nyle Steiner's Homemade Mag Amp schematic (with the dual diodes), and a few other mods to create an equivalence of Eric's LMD, because the principle of mutual saturation was already built into both circuit concepts. Last edited by Vinyasi; 03-22-2018 at 02:55 AM. Have you ever looked into Eric Dollard's magamp design posted in his thread? Polakowski built a crude version of it in the past and it had promising results. I have all the parts here, but haven't had time to assemble it. I have to disagree. Partially, at least. The increased number of raised nails are reshaping the extension of the magnet's field to make it more intense. Less raised nails would be a weaker extension. Since magnetism cannot be barred with the use of any kind of barrier, the only thing left remaining which can be done is to extend a magnetic field through magnetizable material. Your examples of ferrous fluid exhibits this property. This increased intensity is stronger at repelling surrounding nails causing a widening ring of non-raised nails. That's all. Nothing else. No dielectricity is being invoked unless equivalent to this explanation as well. The reason you have to use greater force to shake more nails towards the magnet is due to the formation of a ring of repulsion surrounding whatever quantity of nails are shook towards the magnet. The greater the number of nails results in a greater field of repulsion surrounding those nails. This is similar to osmotic pressure. The greater number of ions absorbed results in less osmotic force of absorption - a form of negative feedback. In other words, despite our obsession with magnetic poles as if that's all what magnetism is about, there appears to be another force opposite to magnetism which does not align itself with the Bosch wall, but with the whole exterior space surrounding magnetizable objects at right angles to their poles. If this is the dielectric field of a magnet, then so be it. But this is a result of magnetism and in no way interferes with it. Instead, this other force is at the mercy of magnetism. Magnetism is dictating its own world. Nothing else is interfering. In fact, I will go further in speculating that if some other force exists apart from magnetism, then this other force can only be noticed if magnetism steps aside. Otherwise, the heavy-handedness of magnetism obliterates all appearance of this other force's presence. Remember what Eric Dollard says about two of the three elements making up the synthesis of electricity, namely the two forces of: dielectricity and magnetism (the third element being time) -- each force exists only in complete denial of the other force. Also recall Eric's experiments with the space between two true Tesla coils (the ones with spacings between a singularly layered winding held on an armature) in which Eric made a galaxy appear in burnt out street lights. This space was a null zone in which the electromagnetic influence of his two coils canceled each other out. That's where the dielectric appeared. This explains our use of counter-wound coils: to neutralize the average of the magnetic field of a coil, its dielectric field, by neutralizing its polarity of voltage and thus isolate the coil's net behavior to that of the magnetic/amperage/current quality, only. Current is always isolated to a single track of passage while voltage is a field extending outside a track. So, voltage polarity gets canceled with counter-wound coils while current is preserved within the confines of each track. Dielectricity can only be inferred since it appears as a statistical result of a magnetizing current. Magnetism can be measured since it appears in the same manner as current in a wire appears. whenever someone tries to explain energy from counter space, this scenario is what comes into my mind.. and the counter space is the area where antman stopped shrinking.. sometimes its so great it appears as if I'm studying a fantasy..
Executing a circuit and theorizing why the circuit does whatever it does are vastly two distinct actions. The former is precise. The latter has innumerable variations /including physics/ - none of which deters the former. Consider the latter as light entertainment loosely based on the former and take another swig of V8. Ah! Feel better? I certainly don't need a green card to perform heretical physics. If a circuit violates the laws of physics, then maybe physics is unconstitutional? Immoral? And irreligious? Ultimately, in denial of the self. None of which matters to me. My only concern is where does reality fall short of my simulations or where does the simulator's theoretical electronics fall short of reality whenever simulating Eric's theme of a dual capacitor coupled to a dual inductor, mutually saturated, unstable LMD analog computer module if none of these simulations can be built? Last edited by Vinyasi; 03-23-2018 at 09:44 AM. sometimes maybe I like to think in terms of coming up a better explanation of this "Dielectric force".. i mean It's there alright and the most logical explanation of its source was from the infinity inside, since It pulls things together.. like some black hole or some sort.. not to the point of getting into another dimension like explanation.. something that makes much more sense.. but who can think in terms of infinity huh?.. ..
what if.. its all just like "Temperature" when you evacuate the "Electric temperature" of the capacitor, the ambient background will pour some of its temperature into that capacitor, so that when you put back the temperature that you have evacuated, it's more than it was before..
your statement reminds me of the book "Occult Ether Physics"..
but back on topic, I don't think you can get "Unlimited Gains" there's a certain limit on which everything will balance, IMO that's what the nature has been doing from the start, and always have been, to balance things..
We talk about the higgs field we can trap an electron by a proton. and we describe a source called higgs that is turned on everywhere. Higgs field gives the electron mass. We do not understand what dark matter is. The early days of computers were dealing with negative zero, but couldn't deal with it in an honest way. They had to hide it by performing two's compliment arithmetic at the terminus of an operation so as to not result in a negative zero whenever a quantity was subtracted from itself. Anyone who's studied the I Ching, Chinese Book of Changes, knows that anything taken to its extreme flips, inverts, into its opposite. So, magnitude may seem intangible, but polarity is not. But from the perspective of a computer's register (the thingy holding onto all those one's and zero's), the limit of that register (be it a 16 bit register, or a 32 bit register, or whatever number of digits base two it can hold) is - for all intents and purposes - infinity. But the catch, in this system, is there are two infinities. Who has ever quantified zero, anyway? That's looking at it from the perspective of the individual digits, base two. But from the standpoint of the entire register, regardless of its size, there's only two numbers which exist in the entire universe in base two. That is: zero and infinity. Now, this is not useless philosophy. This has practical benefits. See if you can use this line of logic to partially, or completely if you're more fortunate than I, define division of any real number by zero. Now, can you do it? Any more readily than before this discussion? I can. I can define it (if my memory serves me) for one case out of four possible cases, partially define it in two, and not in the fourth case. What do you think these four cases are? Do they satisfy all possibilities? Although the I Ching, and the Tao for that matter, delineates these two extremes as Yang and Yin, the Vedas go one step further by making this into a trilogy: Sat-Chit-Ananda: Energy, Intelligence, Bliss. Yang and Yin are defined quite well by two of the eight trigrams of the I Ching: Chien (three solid line trigram) for Creative Fullness of Energy and K'un for Voidness of Intelligent (three broken line trigram). I think that it is the Brahma Sutras of the Vedas which proclaim: "Two fullnesses: fullness of fullness and fullness of emptiness...." [Purnamida; purnamidam] "...Take fullness from fullness and fullness remains." Would it be too far a stretch of the imagination to suppose that the aether may be more than merely the numeric equivalence of the complex number field quantifying counter-space as Eric describes? What if it's an unlimited void, or fullness, of energy which is non-quantifiable in that realm/state of its existence? What if it can only be measured by real numbers out here in physicality due to infinity having been split off into multiple physical infinities which we count, ie measure, as definitive quantities of infinite identities? Kind of makes ya think, uh? How much Aether is in your Coffee? If a mind can meditate, transcend the physical world of the senses, and experience Sat-Chit-Ananda at its fundamental source beyond this trilogy, then infinity (or Friedrich Nietzsche's existentialist void) is not beyond the mind's experience. It's merely beyond the mind's grasp as a concept on par with everything else we take to be the exclusive domain of the mind, namely: quantifiable by our senses. I think Eric is doing a superb job of quantifying the intangible. It sounds voodoo-ish, but who cares? Charlie Lutes always used to say that scientists of the future will become more like priests and priests will become more like scientists. Go figure? Unlimited gains are the infinite potential realm which the simulator suggests due to my interpretation of trends. A circuit trending upwards in gain with no terminus in sight, accelerating logarithmically as Eric says they do when exhibiting the behavior of an impulse current, is an unlimited gain in my opinion. Why? Because the simulator has an arbitrary limit set at 10 raised to the power of +/- 48 (again, if my memory serves me last time I checked Paul Falstad's electronic simulator). And BTW, I think the LMD module of Eric performs at least one function which I can recognize: that of magnifying a trend. So, if a trending circuit is gaining, then that's what it will continue to do ad infinitum. But if the circuit is trending towards null, balance, or zero mid-line on the oscilloscope tracing, then the LMD will lock in that trend until its limit is reached or its asymptote is approached from which an infinite limit may be suggestive. Out of all this talk of infinity, I think what Eric is doing with the concepts of counter-space and complex numbers is quantifying the engineerable amounts of magnetic catalyst entering into a coil or the dielectric catalyst entering into a capacitor's dielectric to stimulate a fixed, but partly non-predictable, quantity of these two basic energies springing out of these two fundamental electronic components to synthesize electricity under certain conditions outside of their commonly understood functions to merely: "give OUT whatever they take IN" minus thermodynamic losses, etc. Thus, they possess two practical functions: one unconventional and the latter very conventional. Oh, and by another way, one limit - or balance - of Nature is the tolerance in any particular circuit for exhibiting infinite gain before it melts, explodes, etc. So, in theory: energy is limitless while in practice our circuits can only take so much abuse beyond their tolerance. I think impulse current is a stressful experience for the physicality of a circuit at any quantity since impulses are unpredictable, extremely variable, etc despite the irony that impulse current springs from infinity: the ultimate state of non-stress! I once visited a dream analyst who also specialized in the I Ching, among other things, and he said that: "the experience of some reality or another by the mind beyond its cherished habits can be very enlightening. But woe to whomever can't handle that experience. For they could go insane if not adequately mature enough." And the body must be stable as well. Borax in my fruit juice helps me since my body has gone through tremendous stressers which would have left me dead a few times over had I not investigated various health protocols. Whatever helps the body will help the mind. Last edited by Vinyasi; 03-26-2018 at 12:17 AM. Different from that - may have been posted by Polakowski. I think I have them in my archives. I'll post them here if I can find them. From the definition itself "Infinity" if you have got away to tell what is "Infinity" then that is not "infinity".. but we can grasp the Idea of "Infinity" really well..
negative zero are errors and illusions and are one of the "Contradictory terminology" that exist in our reality that we cannot define properly. number zero serves as a reference.. the sole purpose so that we can "Quantify". the results on the simulators are only defined in the limit of the simulators itself. the effects are only up to what the programmer understand in the reality that he is trying to "copy". If he missed one thing, the result can be a total loop or infinity. I speak of one who does programming as well. and Infinity or Loop is the thing we avoid/eliminate as It will cause the program to "Hang"..
but not in real life experiments.. I've designed and built circuits that was supposed to have "Infinite" gains according to my understanding but did not.. simply because I have not understood the reality completely..
but I learned from that..
and this is what I'm telling now.. It will show a "gain" but will start to decline if you do not sustain it from some source..
one thing that I'm sure based on my previous experiments.. all the "Potential" go down to the equilibrium of the system, the "Imbalance" will balance, the rate of which this "Potential" returns to equilibrium with regards to the time It took to equalize in seconds is called "Energy". EPD has been telling that right?.. it's not some primary thing..
but sometimes it feels as if something is missing or not right in it.. It had appeared to me that one's compliment arithmetic's need to polarize two relativistic limits, within the boundaries of the number of digits/bits within its registers, as two similar magnitudes of opposite polarity equivalent for all intents and purposes as its definition of infinity was also formulated in the Tao and I Ching. Taking this one step further, I believe this is useful in defining the division by zero problem as a permutation of four options. ... and the epitome of fruitful gain: Eric's recipe for the synthesis of electricity as noted below. At least Paul's simulator does not implement a policy of suppressing surges early on in their development such as Micro Cap does, nor prevent any buildup of electrical potential such as LTSpice does with its error message: "Floating Node". Paul did have one annoying policy which I removed from my mirror of his simulator, that of arbitrarily assigning a limit to the current of diodes and transistors stating in his program source code that they tend to give 'weird' results which I assume he meant anomalous overunity, but is otherwise pure theory as imperfect as that is. The user certainly has to use his or her imagination to make up the difference. Namely, any of my simulations cannot be treated as if they are schematics to build from. Instead, they have to be interpreted by people like yourself who know better. It would be better to call a simulation of overunity an indication of an alternate line of reasoning the details of which (except in Eric's case) is missing from our collective awareness. Someday, when public/corporate policy stops competing against our pursuit of learning, we'll have simulators more similar to the perspective of a Dollard, Bedini, etc. Until then, I have to make do with what's available, push the limits of convention to initiate reasoning along new threads of thought and hope that I leave my world in better shape than I found it. Sometimes, this is not accomplished by taking the direct approach of being a do-gooder, but by taking the opposite approach by being - what society more often than not deems to call such people: the outlaw (think: "Outlaw Josie Wales") - or rabble rouser. Discontinuities along a transmission line, of a closed loop geometry, can result in a rampant escalation of power towards infinity - despite the initial fixed amount of energy - based on the complex interaction of reflected (conventional absorption and discharge) and transmitted (possibly skin effect) waves interacting with an extremely low-level capacitor, or pair of capacitors, of 1pF or less between two transformers. ... and increases frequency at the expense of amplitude. With the help of mechanical switching, surges can be maintained, indefinitely. It is these surges which will add to the depletion of amplitude thus insuring the continuation of magnification of power to any degree desirable. Magnetism surrounded by a changing electrostatic field. Last edited by Vinyasi; 03-30-2018 at 06:03 PM. So, there's no electrostatic lines of force passing through each transformer coil? Last edited by Vinyasi; 03-31-2018 at 02:55 AM. so If I use light bulbs instead of coils its considered transverse?.. If I use a battery dc source instead of ac source its considered transverse?.. As far as I know, when the capacitor is placed to isolate the source from the load/coil, it should be considered Longitudinal as the phase conjugate electricity is powering the load, as one plate of the capacitor becomes LESS negative, the other side tries to be MORE negative.. and vise versa.. I see it as a natural reaction to pressure (voltage) changes..
on TEM, LMD dispute.. in both our circuits, they both have transverse waves that radiates away due to conduction current, and Longitudinal waves that is happening in the capacitors or wherever there is a conductor-insulator-conductor arrangement and this is due to the electric potential build-up..
whenever there is a CAPACITANCE there should exist a Longitudinal wave..
whenever there is a CONDUCTOR there should exist a Transverse wave..
and why do you make it sound like conduction current is Transverse?.. that is like saying a water flowing in the pipe is transverse..
of all this what is the relevance of it to our discussion which is the "Unlimited Gain" ??.. I know it's relevant to transmission..
Are the light bulbs in Parallel? Not in Series? Obviously a TEM arrangement. Not the same as mine due to light bulbs are in the wrong place. They should be in parallel; not in series to be an LMD configuration. Only capacitors may be in series. Otherwise, it's a TEM arrangement. Besides, are resistive loads, ie lamps, equivalent to inductive loads, ie coils and transformers? see diagram above, that is the basic concept of that circuit, It charges a capacitor through a load, and discharges the capacitor through a load as well..
so is the circuit Transverse only?.. or Longitudinal Only?.. if so how?.. I have answered that both wave exist in the circuit and so does to yours. and I've explained how I perceived it..
as to the series and parallel disagreement.. If you will look at it closely, when the switch flips at Pt B. not only everything is in SERIES LOOP connection, capacitors and Load/Inductor is also in parallel..
and this is why I'm saying your Inductors are in series. I'm not comparing Inductors to resistors, what I'm trying to say is, that current in your circuit will not go to "Infinity" as what you are claiming. and please don't make it sound like I only tried with "lamps".. the build has terminals I can switch to Inductive loads whenever I wish.. (which I already did).. I even tried to use a short piece of wire.. to prove that what I'm saying that the circuit is in "SERIES LOOP" still a series connection that we can add all the resistance and determine the current flowing in it..
whatever it is that your seeing in the simulators are not what I'm seeing in real life circuits.. that is the fact.. proven by experiment. I hope I have made myself clear to that. Both. Transverse in the coils and Longitudinal in the caps. But which predominates? And which is the consequence...Decomposition or Synthesis? Do the capacitors accelerate current outside themselves in the rest of the circuit? Is the relationship between the capacitors and the inductors such that the inductors allow the capacitors to accelerate current in the inductors? If the overall capacitance is high enough relative to the overall inductance, then nothing non-conventional will occur: electricity will decompose into its constituent parts of magnetism and electrostatic charge adding to thermodynamic losses, thus decelerating the circuit's current. Yet, if the overall capacitance is low enough relative to the overall inductance, then electricity will synthesize from its component parts adding to its losses. And if it adds more than it loses, then overunity should manifest. There are two quotes of Eric stating that mere coils and caps can synthesize electricity. The http:// is.gd/ acmotor simulation is not an LMD nor a TEM modular structure, yet the inclusion of the low level pair of caps alters the overall behavior since they are low enough in Farads to accelerate current against the resistance of the wire - especially the wire in the coils. And the coils lack sufficient resistance due to their moderately low level of inductance and thus fail to offer any significant resistance to the accelerative influence contributed by the caps. The biggest problem in overunity is resistance in the wire: simple resistance and inductive resistance. ...in which if those two factors are balanced in a solenoid, then you get a Monopolar Transformer. It is this ratio that I seek by trial and error since I know no engineering and possess none of that skill. It's usually not precise in the simulator, but multiple windows of minimums vs maximums of the circuit's inductors and capacitors for overunity to occur. Parallel vs Series is shorthand for indicating which of the two constituents of electricity predominates if we have a daisy chain of modules: a classic Eric Dollard analog computer. But it's not always so clear cut as your circuit and my http:// is.gd/ acmotor circuit demonstrate. Then we have to be more accurate in our appraisal of the situation by admitting that parallel vs series has nothing to do with it. It's the longitudinal vs transverse which counts and that's determined by both the arrangement of coils and caps in a circuit, but also by the overall values of their inductances and capacitances contributing to the circuit, because the question still remains: is current accelerating or decelerating in the wires and the coils? The current in the coils will only accelerate if the cap's longitudinal wave in the counterspace dimension gets small. When this happens in a cap, the opposite effect occurs in the space of a cap's dielectric material in which the space, or distance, increases. In other words, the dielectric along the line of transit gets longer separating the cap's conductive plates vs their square area shrinks by comparison. Since the longitudinal wave will have less distance to travel in its counterspatial medium of the dielectric of a capacitor, the spatial dimension to manufacture that dielectric will have to do the opposite: fabricate a thick layer of plastic or aluminum oxide embedded in a ceramic material to increase the spatial distance of the dielectric lines of force stretching between the cap's conductive plates even though in the reality of counterspace the opposite is happening: the counterspatial transit length of a longitudinal wave traveling through the dielectric material of a capacitor shrinks. Then Nature balances this by making it appear to our spatial reference that the longitudinal wave inside a cap's dielectric material has accelerated when in fact all the wave did was have less distance in its medium of counterspace to travel to get from one conductive plate on one side of a capacitor to the other plate on the other side. But at the boundary between the dielectric material of a capacitor and each plate on either side, a transition occurs: the longitudinal wave traveling across a dielectric medium converts into a transverse wave at either plate of the capacitor imparting all of the longitudinal wave's acceleration or deceleration to the transverse conversion of itself. This conversion makes it possible for the capacitor to accelerate or decelerate the current immediately adjacent to either side of its two terminal connections of the surrounding circuit. Thus, the magic happens (the magic being anomalous unconventional synthesis of electricity) inside the caps if it happens at all while we don't appreciate this until it appears in the coils and wires where we can measure it, because counterspatial behaviors cannot be measured, but they can be inferred with the help of a concise dose of Eric's theories. A dielectric medium in our reference of space can be either of two extremes: the extreme compression of bedrock which Tesla set his ground transmission at Wardenclyffe into or the complete void of empty space. Either way, a longitudinal wave traveling through either of these two spatial mediums will behave the same way. A transverse wave will only occur if molecules (for instance) occur at just the right intervals of distance between each molecule for a domino effect to occur, namely: the longitudinal wave can no longer travel through this impure medium of interspersed obstructions without being forced into a conversion of itself into a transverse wave and thus lose all of its force in a very thermodynamically predictable fashion. Transmission through wet soil will do this. These two options gives us two choices for a dielectric medium within a capacitor. It also gave Tesla an opportunity to conduct a longitudinal experiment exceeding the dielectric capacity of manmade capacitors by sending a longitudinal wave to the moon and back through the medium of empty space. This is where: "Energy from the Vacuum" gets its relevance. That large distance in space resulted in a ridiculously shrunken distance in its counterspatial counterpart which had the distinct advantage of accelerating that transmission to a factor of fifty times faster than the speed of light - much faster than Eric's Borderland experiment in which Eric merely exceeded the speed of light by a factor of 57%, or one half pi times the speed of light. Last edited by Vinyasi; 04-02-2018 at 12:38 PM. I guess we have come to an agreement there..
yes both wave exist but IMO neither predominates. current traveling in wires generates transverse, and voltage build-up on caps, generates longitudinal,..
decomposition or synthesis?.. 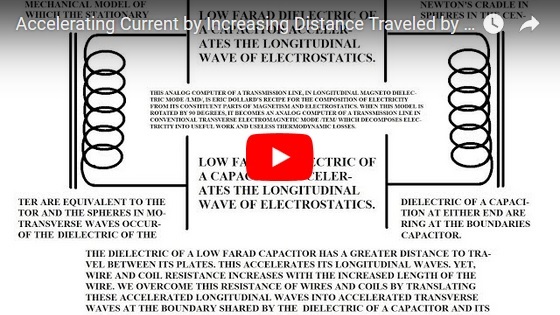 my current understanding of "energy" led me to think neither, for me energy is a rate of imbalance returning to equilibrium, which we can quantify referencing to the "ambient" or "ground" with regards to electricity..
another look at "current accelerating on low capacitance".. I see it more as Its "Instantaneous" since its a "Reaction" on the other side of the capacitor... (newton's third law of motion). IMO electricity is much more understood mechanically by grasping the "Aether" concept. electricity to me makes much more sense with it. rather than the "Vacuum".